I just returned from a small conference on “Observations of Dust in Nearby Galaxies” at the University of Arizona in Tucson. It honored Chad Engelbracht, an influential astronomer in the field who rather suddenly passed away in January, before his 44th birthday. It was great to be back in Tucson! This was my first visit since I moved away in 2012. I worked as a postdoc at the University of Arizona—an internationally renowned center of theoretical, observational, and instrumental astronomy—for three years, and I spent much of that time working with Chad on research projects with the Key Insights on Nearby Galaxies: a Far-Infrared Survey with Herschel (KINGFISH) and Herschel Inventory of The Agents of Galaxy Evolution (HERITAGE) surveys. 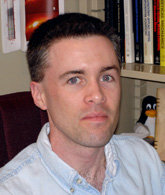 Chad has written numerous publications on extragalactic infrared astronomy, especially on the distributions of dust, stars, and gas within galaxies in the “local universe.” He was also the MIPS Instrument Scientist for the Spitzer telescope, which enabled a lot of excellent research by others. As you may know, I’m trained in theoretical astrophysics, and my expertise is in the large-scale structure of the universe, dark matter, galaxy formation, and cosmology, and when I’ve used data, they’ve usually been in optical wavelengths. Needless to say, I had a steep learning curve to navigate in order to work on my infrared research, and Chad helped me up it. Chad was my friend and colleague, and I really enjoyed working with him. He was patient with me, had a great sense of humor, gave me insightful suggestions and feedback, and helped me produce interesting results. (The two main papers we wrote together are here and here.) If I continue with my academic career, he would be one of my role models. Many of Chad’s colleagues and collaborators attended and spoke at the conference, including Rob Kennicutt, Margaret Meixner, Bruce Draine, Maud Galametz, and Dennis Zaritsky. I was moved by all of the personal and astronomical tributes to Chad throughout the conference. It’s clear that he influenced, inspired, and was respected by many people. His legacy lives on. Chad is survived by his parents and siblings, his wife Sue Dubuque, their three children (Max, Sydney, and Henry), and his numerous friends. He is missed. ← A pretty good first year! Thank you posting this review of the conference “Chad-con”. as his bereaved parents, we were so privileged to be there and hear the impact Chad had during his too-short life. Thanks! It was my honor to be there at the “Chad-con” conference and I was happy to write a review about it.